Learn & Enjoy Indian Classical Music with Raga. Here is the perfect match of computers and tradition. Have your own Music Guru introduce you to Indian Classical Music. Watch the video demos, read the book and hear the music, all on this one CD - Rom ! It dosen't matter if you are a novice or a classical music buff, this CD - Rom can cater for any learning level. Work through the CD at your own pace, view the 24 modules with 45 minutes of video instructions from a qualified teacher. Whether it's North Indian Classical or South Indian Carnatic listen to the samples of 54 Ragas or 15 different Talas. Listen to the note patterns of each Raga. With 54 classic film song clips you will learn how modern day film songs derive from parent Ragas. You can also hear a dozen instruments play when you click on them. The CD - Rom presentation comprises of 24 modules of video instruction of some 43 minutes duration. This is backed up by a more detailed book version with audio clips identified at various junctures to illustrate the concepts being discussed. The book section traces the origins of Indian Classical Music, the Raga form, its elements and notes, and the grammar of raga structure s as applied to both North Indian Classical and South Indian Carnatic forms. It then goes on to discuss the rhythmic patterns and structures in both Genres. There is a coming together of all this in a section that explores concert performances in both Genres, various musical styles and traditions and the major instruments in both musical variants. There is also a detail elaboration of a variety of sub-genres and musical forms, classical, semi-classical and devotional as pertains to both these Genres. This includes Dhrupad, Dhamar, Khyal, Dadra, Thumri, Tappa, Bhajan, Qawali, Gazal, Gitam, Svarjati, Varnam, Kriti, Ragam, Tanam, Tallavi, Javali, Thilana and Padam. 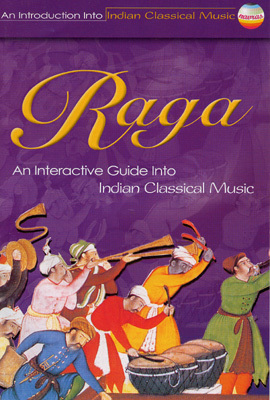 In addition to the video and book sections, there are some 54 Ragas froom both the systems of music elaborated, with their scales, major phrases and samples of classical and popular rendering, the latter from film songs from Bollywood and Madras- Based Films encompassing a period of past 50 years or so. The links enables an understanding of the importance of classical in even the lighter and popular forms of music through the Raga Structure. The notion that classical music is exalted and high brow and that it does not touch or affect the "lesser minds" or a wider world of music is effectively dealt with through this illustration.
? Multimedia PC with 486 or higher processor. Pentium II or better recommended.
? Windows 95 or Higher.
? CD-ROM Drive. 4 X.
? 16 bit sound card and speakers.